China and Russia, which have billions of dollars in loans to Venezuela, back President Nicolas Maduro. As does Cuba, its political and military patron. 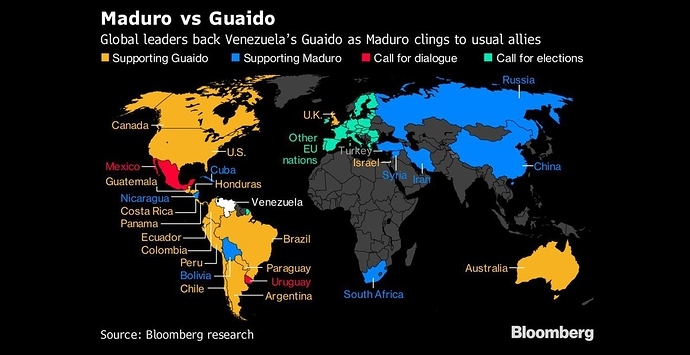 While the U.S. and most Latin American nations, which have felt the brunt of a migration crisis, back the head of the National Assembly, Juan Guaido. It isn’t politically correct in the east for countries to turn hostile to Latin American countries simply because Washington decided it. Who saw this is coming that Venezuela will break the world apart? We are talking now about two different political regimes, which actually clarify the position of the political and economical forces worldwide. Antidemocratic regimes do not lead to anything good.